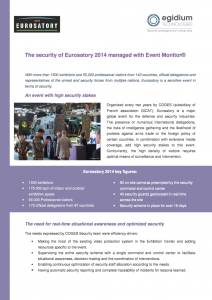 With more than 1500 exhibitors, 55,000 visitors from 143 countries and many official delegations, Eurosatory is a sensitive event in terms of security. Organized every two years by COGES , Eurosatory is a major global event for the defense and security industries. The likelihood of protests against arms trade or industrial intelligence gathering attempts add high security stakes to this event. Meanwhile, the sheer number of visitors requires optimal means of surveillance and intervention.